The team of Danny McBride and Jody Hill has delivered a handful of variations on the same theme and characters over the years. Their 2006 film The Fist Foot Way garnered them a great deal of attention, leading to Hill writing and directing the incredibly dark mall cop comedy Observe and Report, starring Seth Rogen. That same year, Hill turned his sights to TV, and with McBride once again his star (maybe even his filthy-mouthed muse) the two created Eastbound and Down, which doubled down on the duo's debauched sense of humor, and in main character Kenny Powers, further established the sort of personalities that populate their work together. That work is often a distillation of McBride's most common onscreen persona: the irritating braggart who wants desperately to be thought of by others as he sees himself. And their newest HBO series, Vice Principals, is no different, though it does generate plenty of new comedic opportunities thanks to the particular milieu evident in the series' title and by pairing McBride with the great Walton Goggins, as Lee Russell, an unlikely ally in some incredibly underhanded dealings to depose the newly seated principal Dr. Belinda Brown (Kimberly Hebert Gregory). And while the persona of Neal Gamby may be familiar territory for the actor playing him, that familiarity doesn't diminish the series' comedic efforts (especially in the premiere) or the underlying sense that Vice Principals has something to say about its characters' sense of entitlement and the repulsiveness of their reactions to the dissatisfaction they feel in their lives. McBride specializes in characters whose exaggerated talk and empty boasting is a cover for a pitiful personal life that's often lonely and unfulfilling, and Neal Gamby is, for all his amplified idiosyncrasies, maybe the best representation of that character he's done yet. He and Hill have taken on the difficult task of setting a series around a pair of buffoons who, as the show progresses, demonstrate ways in which maybe they aren't entirely unsympathetic. Neal's deteriorating professional life is a prickly mirror to his already dismal personal life. 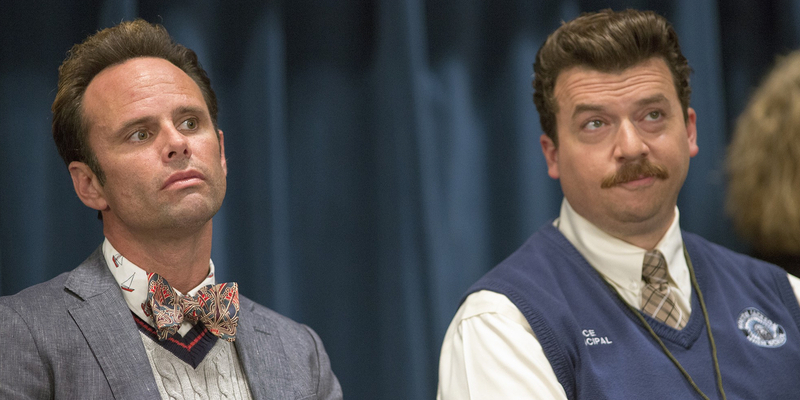 Vice Principals presents Neal as the most unlikeable person in the room at any given moment. Even Ray, the motocross-enthusiast played by Shea Whigham who "stole" Neal's wife Gale (Busy Philipps) and increasingly earns the affection of Neal and Gale's daughter Janelle (Maya G. Love), is presented as a likeable guy. This contrast is where the series finds the majority of its humor; roles that would normally fulfill certain archetypes are flipped and the audience is left spending all of their time with a pair of characters driven by resentfulness and spite who nonetheless must find a way to be appealing beyond their seemingly unrepentant cruelty toward the woman who landed the job they so desperately want. Goggins' Lee Russell makes for an interesting contrast to Neal's blustering bravado. Both men present a false front, but whereas Neal's transparent air of confidence and capability makes him even more of an arrogant lunkhead, Lee's affable veneer affords him certain comforts at work – he sits with the faculty during lunch, while Neal surveys the cafeteria with food-service worker Dayshaun (Sheaun McKinney). Lee seems to be concealing more than just his inner rage towards Dr. Brown, and Goggins uses that distinction to color his performance and to give the character greater depth as he shuttles back and forth between exhibitions of a sociable high school administrator and the sort of ruthlessness he gets up to in later episodes. The role is at once similar and a far cry from Goggins' unforgettable work as Boyd Crowder on Justified. As an actor, he specializes in making the worst features of his characters seem like attributes, while making use of certain distinctions that guarantee he'll standout without overshadowing the rest of the cast. It's a fine line that Goggins performance is again nimble enough to walk. Although it can sometimes make for one too many uncomfortable moments, McBride and Hill's cringe comedy makes good use of its episodic format. Instead of tackling the difficult task of getting to the bottom of an unlikable character in the span of 90 minutes or so, Vice Principals takes its time in peeling away Neal and Lee's layers, the first being a ceasefire at the end of the premiere as the two agree to team up against the adversary they have in common. While this at first seems antithetical to the premise being sold in advertisements for the show, it winds up allowing the series a much greater scope than seeing two numbskulls chasing one another around a high school. It also gives both characters a more human arc and more interesting, underlying want than attaining the job of principal to soothe their easily bruised egos. As the series is slated to run just two seasons, it stands to reason that those character arcs will play a greater part down the line. While the promise of such a short run may be unfamiliar to audiences still used to series being in it for the long hall, knowing the end is coming gives Vice Principals enough of a narrative thrust to help sustain it, even as the humor goes from eliciting belly laughs to shock and sometimes pity. Early on, it would be appropriate to describe the series as a dark comedy – especially after what happens in the second episode – but before things can venture too far into the heart of darkness, McBride and Goggins' alliance steers the ship in a surprisingly sensitive direction that threatens to turn two obnoxious schmucks into a pair of sympathetic putzes who may unwittingly be on the road to self-improvement. Vice Principals continues next Sunday with 'A Trusty Steed' @10:30pm on HBO.